American citizens who want to be evacuated from the war zone that Lebanon now is - with the ongoing conflict between Israel and the Islamic militant group Hezbollah - lined up near the U.S. Embassy in Beirut and were bused to a cruise ship waiting in the harbor. Women carrying backpacks and clutching their children, and others pushing strollers walked from buses to The Orient Queen ship where the crew welcomed them. The group of about 200, which represents only some of the Americans who are still in Lebanon, will first be evacuated to Cyprus before being flown to Baltimore-Washington International Airport. As Americans waited to be bused to the ship for the first large scale evacuation – about 1,000 are expected to leave on Wednesday - a small number of Israeli troops crossed over into southern Lebanon, searching for tunnels and landmines, and a loud explosion was heard in southern Beirut - apparently an Israeli airstrike. Also early Wednesday - heavy fighting is reported in the Lebanese border town of Avivim, and witnesses in Israel said they believe they saw an Israeli soldier forced into a vehicle in a possible kidnapping - a report that has yet to be confirmed or denied by authorities. The U.S. says there are no plans to put U.S. Marines ashore in Beirut for security unless conditions change. As many as nine other U.S. and coalition ships are enroute to the region, including vessels from the United Kingdom, Spain and Italy. Some of the U.S. ships will take passengers to Cyprus while others will provide escorts and protection for the larger commercial vessels ferrying the Americans out of Lebanon. Israel said Tuesday it is prepared to fight Hezbollah guerrillas for several more weeks, a statement which raises doubt about the chances of growing international efforts to broker an immediate ceasefire. Diplomatic efforts to end the fighting continued Tuesday. A U.N. mediation team met with Israeli leaders, a day after speaking with Lebanese officials in Beirut. Israeli Foreign Minister Tzipi Livni, who met with the delegation, said a ceasefire is impossible unless the soldiers captured last week by Hezbollah are released and Lebanese troops are deployed along the border with a guarantee that Hezbollah will be disarmed. Livni's comments suggest that Israel will not insist that Hezbollah, a Shiite militia that controls southern Lebanon and routinely launches rockets into Israel, be disarmed before any ceasefire deal can take effect. Fighting between Israel and Lebanese guerrillas has stretched into an eighth day. The fighting has killed more than 200 people in Lebanon and 25 in Israel. More than 750 rockets have hit Israel since the violence began, forcing hundreds of thousands of Israelis to take cover in underground shelters. "We have no choice," Kineret Sason told CBS News correspondent Sharyn Alfonsi, as she huddled in a shelter in Nahariya where Israelis trying to avoid the rockets have been living for about a week without running water or air conditioning. Twice while Alfonsi was there, some from the group tried to leave the shelter, and both times within minutes another rocket would hit, driving them back and heightening the panic. CBS News Chief Foreign correspondent Lara Logan report Hezbollah guerrillas fired a new barrage of rockets into northern Israel Tuesday afternoon, killing a man as he ran toward a bomb shelter in the town of Nahariya and setting fire to the top of a two-story apartment building. An earlier rocket hit the Haifa train station - the same place where a rocket hit two days ago and killed eight people. Israeli military action continues in Gaza, where Israeli tanks early Wednesday began moving into the Mughazi refugee camp, under cover of machine gun fire from troops. Israeli warplanes Tuesday struck an army base outside Beirut and other areas in south Lebanon, killing 17 people, and Hezbollah rockets battered Israeli towns, killing one Israeli. In the Lebanese border village of Aitaroun, witnesses say at least five people were killed when a bomb hit a house. Also Tuesday, Israeli warplanes struck the Hezbollah stronghold of southern Beirut, hitting four trucks Israel says were bringing weapons into Lebanon. "That is intolerable terrorist activity," said Capt. Jacob Dallal, an Israeli army spokesman. "They are using civilian infrastructure to bring in weapons, which they are using against us and killing Israelis, and we will exercise our right of self defense to stop the flow of weapons into Lebanon." An Israeli airstrike hit a Lebanese military base at Kfar Chima, killing at least 11 soldiers and wounding 35 others. Lebanese Defense Minister Elias Murr denounced the strike as a "massacre," saying the regiment's main job was to help rebuilt damaged infrastructure. Israelis strongly support the military operation against Hezbollah. A poll published in the Israeli daily Yediot Ahronot shows 86 percent believe the operation is justified, 81 percent want it to continue and 58 percent say it should last until Hezbollah is destroyed. The poll of 513 Israelis had a margin of error of 4.2 percent. The 24th Marine Expeditionary Unit was ordered into the waters off Lebanon to help with the evacuation. The U.S. military will have six CH-53 Super Stallion helicopters available to move 300 passengers a day out of Lebanon. Other U.S. ships should arrive in a day or so. Pentagon spokesman Bryan Whitman said the U.S. also is considering contracting with as many as four more commercial ships that could each carry between 200 and more than 1,000 passengers. Lebanese-American Jonathan Chakhtoura says he is extremely disappointed in the U.S. response. "Every time I call to see what's going on the lines are busy. When they answer, they say they don't know," the 19-year-old fashion design student said. "A lot of people don't know what is going on. There is so much confusion. If it's security they are worried about, then I think we will be more secure if we know what is going on." The State Department says it is not yet known how many Americans will ultimately be evacuated, because some may change their minds as conditions there either improve or deteriorate. The State Department said Monday that it is asking Americans to reimburse the government for the expense of being evacuated from Lebanon. "What we have to do in a situation like this is, we have to go out on an emergency basis and rent vessels," Burns said. "That's what we're trying to do... We do that on behalf of American citizens." House Democratic Leader Nancy Pelosi objects to the billing of evacuees. "A nation that can provide more than $300 billion for a war in Iraq can provide the money to get its people out of Lebanon," said Pelosi. European nations also intensified their evacuation effort Tuesday with a British naval ship ferrying 180 people, mostly Britons and a Greek navy frigate, carrying about 400 Greeks, Cypriots and other Europeans. 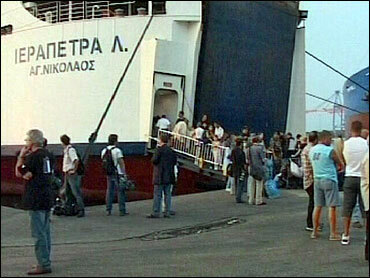 Six chartered passenger ships are due in Lebanon Wednesday to begin evacuating up to 25,000 Canadians. Tuesday, a proposal to send a new international force to bolster the current 2,000-member U.N. force in south Lebanon gained steam. Western nations have proposed the beefed-up force as part of a possible ceasefire agreement. U.N. Secretary-General Kofi Annan says a new force must be "considerably" larger and better armed than the current force, which is viewed as weak and ineffectual. U.N. Secretary General Kofi Annan is to brief the Security Council Thursday on efforts to negotiate a ceasefire. CBS News Foreign Affairs Analyst Pamela Falk says the proposal for a U.N. stabilization force, proposed by Annan and British Prime Minister Tony Blair, has already met with some resistance from U.S. Ambassador John Bolton, who said earlier in the week that the mechanisms were already in place under U.N. resolutions to disarm Lebanese militias." Israeli Foreign Minister Livni said securing south Lebanon "requires activity by the Lebanese government, with the oversight (and) assistance of the international community." Israeli Prime Minister Ehud Olmert says "the start of negotiations will not stop this [military] operation. Only the return of the kidnapped soldiers will." Israeli Cabinet minister Avi Dichter said the country might consider a prisoner swap with Lebanon to win the soldiers' release, but only after the military operation is complete. Israel's offensive against Hezbollah was sparked by the capture of Israeli soldiers in a cross-border raid but has now broadened into a campaign to weaken Hezbollah. In Washington Tuesday, President Bush had a warning for Syria. "It's in our interest for Syria to stay out of Lebanon and for this government to survive," said Mr. Bush. "The root cause of the problem is Hezbollah and that problem needs to addressed." He said there are suspicions that the instability caused by the Hezbollah attacks will cause some in Lebanon to invite Syria back into the nation. U.S. Secretary Condoleezza Rice says any ceasefire agreement should be based on fundamental changes that would have a lasting impact on the region. "We all want a cessation of violence. We all want the protection of civilians. We have to make certain that anything that we do is going to be of lasting value," said Rice. "A ceasefire that would leave the status quo ante intact is absolutely unacceptable," said White House spokesman Tony Snow, reinforcing Rice's comments. "A ceasefire that would leave intact a terrorist infrastructure is unacceptable... So what we're trying to do is work as best we can toward a ceasefire is that going to create not only the conditions, but the institutions for peace and democracy in the region."